I’m not usually particularly topical on this blog but Timmer from Catalunya Wine has forced my hand with his response to the latest outcry about Barcelona tourism. Please let me (and him) know what you think in the comments. If you read the latest news written in Bloomberg and picked up by many publications in the United States, the UK, Canada, and Australia, you would think the new mayor of Barcelona, Ada Colau, is against foreigners. She’s ready to build a moat and castle walls to protect the city from the ravaging hordes threatening to overrun this thriving civic centre. However, this is not the case, nor is the picture painted about what is happening in Barcelona really a true representation of what goes on during tourist season every year. Barcelona is an international and cosmopolitan city. Walking down the streets of the downtown core, you can hear Spanish, Catalan, English, Dutch, Russian, Chinese, Japanese, Italian and a whole host of other languages being spoken, and sometimes within one city block. Barcelona has an urban population of 5 million, and an area of 800 square kilometres. It is ranked fourth in Europe as far as GDP, and is one of the most influential cities in the world when it comes to culture, entertainment, fashion, science, history and art. Barcelona has played host to the Mobile World Congress, and in spite of all the hand-wringing around the world by certain corporate media types, it will continue to host the conference until 2023. It has nothing in common with Venice, other than the fact its treasure trove of architectural and culture history rivals the Italian jewel, and cruise ships stop in the port just like almost every other port on the Mediterranean. For the record, there’s 11 countries with cruise ship ports, and upwards of 50 busy ports in the region as busy as Barcelona, many managing the tourist traffic just as successfully as Barcelona does. I live just outside of the city in Maresme, and when I’m not visiting vineyards as part of my work as Catalunya Wine, I conduct most of my business meetings in Barcelona. Never once have I seen tourists behaving poorly, outside of requesting ranch dressing and bacon bits for a salad, asking why they can’t get a cup of real coffee, complaining about how there’s nothing but Estrella or San Miguel on tap, or how all the restaurants don’t serve a “proper” breakfast. Sure, some tourists can get a little rowdy at nightclubs, but this is pretty much every nationality at every nightclub around the world. As far as beach overcrowding, this I’ve never seen, except in Tossa del Mar where locals and tourists crowd on to a tiny sliver of beach hoping to catch a glimpse of Kylie Minogue when she’s in town. 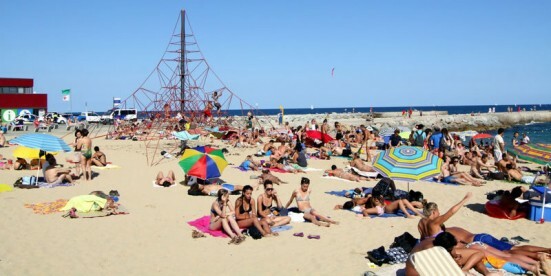 While stories like the one written in Bloomberg are great for sensationalistic-headline-grabbing-socialist-fearmongering-grandstanding, the reality is Barcelona is a proactive community which has managed to balance the needs of its residents while providing a welcoming attitude to visitors to its numerous attractions city-wide. Colau’s platform, on which she was elected, is less about the problems in Barcelona and more about the problems caused by Popular Party policies out of Madrid, or economic policies forced on the country by the EU/IMF/ECB, and their impact on Barcelona’s citizens. Never once has she stated she wants to stop progress or growth, but to take the needs of the residents as a top priority when discussing both. The real issue, however, is the behaviour of certain tourists when they go abroad. The minority ruin it for the majority. A few Italians going naked in Barceloneta must mean ALL Italians coming to Barceloneta will be naked in the supermarket. Brits drinking, carousing, and singing at the top of their lungs in a rental flat must mean ALL Brits will do the same when they rent a flat. I won’t even go into the ridiculous behaviour of Americans during their so-called spring break period, or pretty much any football fan in Europe when they visit a rival stadium. Nor will I discuss the Canadians who decided to strip at the top of a sacred mountain in a Muslim country and brag about it on YouTube. Selfish entitlement is the problem. Certain people, no matter the nationality, feel they are entitled to act a certain way to relieve stress, blow off steam, or escape from the job they hate. The thought process goes they DESERVE to act like lunatics because they’re not allowed to act like lunatics at home. The problem isn’t city policies, or policies towards tourists, but poor parenting. Those with grandiose self-centeredness can’t seem to grasp their behaviour’s impact on the people where they have decided to act like Justin Bieber, and his entourage, do while they’re awake. If these uber-guiri trash a hotel room, destroy an Airbnb flat, run through the streets in nothing but adult diapers, pee on architectural treasures, or harass locals on the beach, they fail to understand the impact of their behaviour and how it makes residents feel. They also ruin the reputation of others of the same nationality who aren’t uber-guiris. Would you go to a close friend’s home for dinner, show up in a diaper, scream at the top of your lungs, knock over the television, spray cava on the walls, throw food at other guests and then proceed to do this for five days when you were only supposed to be there for dinner? Of course not. You wouldn’t because you value your friendship with this person. Tourists need to treat the places they visit the same way they treat their in-laws, hopefully with laughter, respect, dignity, and occasional quiet dissatisfaction. When tourists travel, they should take the time to learn about the culture they are going to visit, read up on what might irritate the locals, and take the time to understand how to act when you visit. Tourists shouldn’t travel to Barcelona thinking they can behave on the street like they behave at Coachella, Glastonbury or a nightclub in Ibiza. Don’t even get me started on Magaluf, or as I like to say, Megagoofs. Overall, I applaud Barcelona’s proactive efforts to reduce the impact of tourists on the local citizens, while still allowing tourists to enjoy some of the great places in the city. Park Güell implemented an innovative way to limit visitor impact, as has Sagrada Família. The Arc de Triomf is only open on special days (this has been for years), as are other spots, but you can still photograph and enjoy, while not necessarily being able to enter. Sure, giant tour groups can’t visit a certain market in downtown for a few hours two days a week, but there’s five other days they can. It’s about preserving a legacy for future residents, and creating a sustainable environment for all. Jordi Hereu, Xavier Trias, and now Ada Colau came from three different parties to be the mayor of Barcelona. Hereu is from the PSOE, Trias from the CiU, and Colau now out of the activist movement. Ironically, all three have made statements about balancing growth with the needs of the people of the city of Barcelona. With the way democracy and advocacy works in Catalunya and in greater Spain, I don’t think this is going to change anytime soon. It’s time to put the spotlight where it belongs, not on the policies of the city of Barcelona, but on the behaviour of foreign tourists which visit this great city. If the minority of bad-behaving tourists acted with more class and had more responsible behaviour, maybe some of these policies wouldn’t be discussed, implemented, or deemed necessary to protect the citizens who live and work in Barcelona. My advice to the selfishly-entitled guiris who have zero self-awareness when travelling abroad? Stay home and piss off your friends, family, and co-workers. Leave the travelling to those, like me, who have learned to appreciate and respect what other cultures have to offer. After traveling the world for 15 years working for various corporations, in a marketing capacity, Timmer settled down to a quiet life in Europe and fell in love with Catalunya. 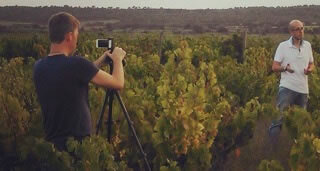 He founded and runs catalunyawine.com, which promotes the Catalan wine region to the English-speaking world, and travels to vineyards in the region to share each of their amazing stores. I think you only got half the story. The other half is how tourists are forcing people to move out of the city. Practically all of my cousins live now outside the city. Gentrification, you will say. Yes, that’s true, but it is a really fast gentrification (neighbourhoods are being transformed in 2-3 years) powered up by tourism. People can rent their places for 1000€ a month to permanent residents or 150€ a day to tourists. Hence the problem. #JoNoMarxo and the so many campaigns are not about people misbehaving. It is about people being expelled. The demographic data has been updated recently, and the city centre and the touristy part of Gràcia is losing population. More hotels and less residents.